A dish carving router bit is used for routing solid wood serving trays or flat dishes. This versatile dish cutter boasts two carbide wings that cut a straight edge with a rounded corner and flat bottom. It is ideal for cutting hollows and recesses into shallow bowls, plates, serving trays, jewellery box trays, coasters, coin holders, spoons and lettered signs. As an added benefit, the rounded corner is easy to clean, and will not trap dust like a square inside corner would. 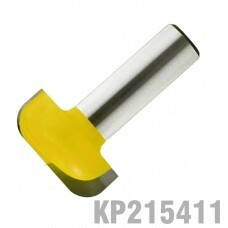 This router bit has a 12,7 mm shank (shaft) that will fit most large routers. Please ensure that you select a router bit with a shank (shaft) size that will fit into your router collet. Fortunately, this is pretty easy. The best way to prolong the life of a router bit is to keep it clean. And what you need to do varies with the type of bit. Note: Sharpening is extremely important too. Resin removers are available. It's the same stuff you use to clean your saw blades. To clean bits with bearings, first, remove the bearing. Then clean the bit as you did with non-bearing bits. It's important to remove the bearings because even though router bearings are "sealed," resin remover can sneak in and dissolve the bearing grease. If this were to happen, you would be faced with the problem of trying to lubricate a sealed bearing. Despite the claims of bearing grease sellers, we've never had much luck with this. Once that grease is gone, just go buy a new bearing. Periodically inspect the shanks of your router bits for rust or burrs. Either of these can be removed quickly with ScotchBrite®. Left on, they can interfere with your ability to properly tighten the bit in the collet. How Fast Should a Router be Running? If you've got a router with variable speed, then you've got the power to improve the quality of your cut. In general, the larger the bit, the slower the speed you need. The perfect solution for dealing with varying bit sizes is a variable speed router. Although most router bits are small, they can be potentially dangerous and should deserve your attention and respect. 1 Use push sticks or a push block to position your hands a safe distance from the router bit. 2 Use large-diameter bits only in a router table. Using bits over 25mm Ø (diameter) in a handheld router can possibly cause you to lose control of the tool and harm yourself or bystanders. 3 Always wear a dust mask as well as eye and hearing protection. 4 Take light cuts. Heavy cuts invite kickback. If necessary, move the fence closer to the bit or switch to a larger guide bearing/bush. 5 Use a featherboard (anti-kickback device) to support the workpiece against the router table and/or fence. 7 Avoid routing small stock. Instead, rout a larger piece and cut it to size afterwards. If you absolutely have to profile a small piece, build an suitable jig or secure the workpiece. 8 Always use a guard. If the fence didn’t come with a guard, make your own. 9 Never start the router with the bit in contact with the material. 10 Don’t force the router bit or overload the router. Excessive heat is an enemy. 11 Secure/fasten the router in the base before starting/switch on the router. 12 Don’t bottom out the bit in the collet or partially insert the bit. Instead, completely insert the bit, and then back off approximately 2 mm. At least 2/3 's of the router bit shank should be inside the collet.